How to import to India from China? How to import from China to India? What are the procedures for registration, import certification, import customs clearance etc to import to India from China? Let us discuss here about the process of importing to India from China. You may discuss about how to import to India from China at the end of this post at discussion forum. India is the one of the largest Importer from the China. Bilateral trade between India and China boomed to $71.45 billion in 2016-17 from $1.83 billion in 1999-2000, though most of this is skewed to Chinese exports. Importer Exporter Code is also the necessity, while importing or exporting goods from China to India or vice versa. 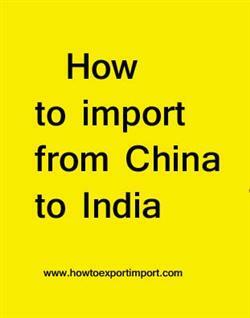 This piece of information explains on how to import to India from China. You may add below your views on importation of goods from China to India. Share your thoughts on how to import goods from China to India. How to import from BELHAI to vizag? Formalities for import from DONG GUAN to vijayawada. Procedures to import from DUO DUO to varanasi. Need to import from DAILIAN to trivandrum,. Explain to import from FANCHENG to ranchi,. Information to import from FOSHAN to raipur,. Step by step process to import from FUZHOU to pune,. Methods to import from GUANGZHOU to patna,. Guidelines to import from HANGZHOU to kanpur. Please guide to import from HAIKOU to nagpur,. Help to import from HONG KONG to mysore. Procedures required to import from HUANGPU to Coimbatore,. Requirements to import from HSINGKANG to mathura. Clarifications to import from JIANGMEN to lucknow,. How can i import from LIANYUNGANG to kozhikode. What should i do to import from LUDA to delhi. Vineet Kumar : On 14 March 2018 My name is Vineet Kumar and I am from Moradabad (U.P). I keep reading your website whenever I have to understand something about import export. Sir, I want to import from China, so please suggest me about some products that are easily sold in Indian market. And how much money I invested in first time import. ARJUN SINGH: On 15 April 2018 SIR,I AM INTERESTED TO IMPORT MEDICAL DEVICES-AUTO CPAP MACHINES FROM CHINA TO MUMBAI,INDIA.PLEASE GIVE ME INFORMATION HOW CAN I GO AHED? ROYAN: On 16 June 2018 SIR, WHAT KIND OF HEALTH CLEARANCE CERTIFICATION REQUIRED BY THE INDIAN CUSTOM NEED FOR IMPORTING REAL LEATHER FINISHED PRODUCT FROM CHINA. Ashutosh Tripathi: On 19 February 2019 Hello. I am Ashutosh Tripathi and I want to import a medical laser equipment from Beijing to Bhopal (Madhya Pradesh). Can you help me with it. How to export from India to China? How to import to China? How to import to USA? How to export from China?